Experience indicates that the performance of a trickling filter can be improved significantly by proper control of the hydraulic regime applied to it. Section 19.2.7 discussed the recent results obtained with the use of mechanically driven distributors. For routine operation, a relatively rapid speed gives optimum treatment. The speed can be reduced periodically, however, causing increased hydraulic shear, with the associated sloughing of excess biomass from the media. This concept has been used historically to control trickling filter biofilm thickness. Several approaches are available for temporarily increasing the hydraulic loading on a trickling filter. One that has worked well with a variety of high-rate media is to turn on all of the influent pumps while directing the flow to only one of the trickling filters. Increasing the hydraulic loading by a factor of 2.5 to 3 times for a period of about an hour is generally sufficient to slough off excess biomass. The frequency with which this should be done can be determined by periodically increasing the hydraulic loading and monitoring the trickling filter effluent. Samples can be collected every few minutes and examined visually. If dark colored (generally black) suspended solids are discharged from the trickling filter during the flushing event, the flushing frequency should be increased. On the other hand, if dark solids are not discharged, the flushing frequency can be decreased. A flushing frequency on the order of once per week is often found to be appropriate. Another approach has been used with rock media trickling filters. A rope is tied to the end of the rotary distributor and used to restrain it. This reduces the rotational speed, causing the same effect as reducing the speed of a mechanically driven distributor. This practice has been referred to as "walking" the trickling filter. 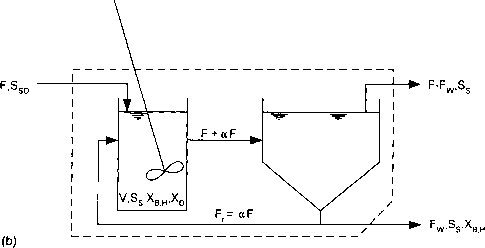 The flushing of dark, anaerobic solids from the trickling filter indicates the need for an increased flushing frequency, just as described above. Odors have frequently been detected from trickling filters. The reasons for this are many and varied, and may be complex for any particular installation. Good ventilation is one factor in odor control, along with control of biofilm thickness to minimize anaerobic activity in it. Odors will also occur when septic wastewater is treated in a trickling filter. Volatile materials will be stripped from the wastewater when it is applied to the trickling filter, and air-flow through the trickling filter will disperse the stripped compounds. In such cases, pretreatment of the wastewater to remove odorous materials may be necessary."'" The operation of coupled TF/AS processes incorporates features of the operation of both components. As discussed above, preceding a suspended growth bioreactor by a trickling filter typically results in good control over the growth of filamentous microorganisms in the suspended growth bioreactor. This is generally a benefit and results in a process that is stable and reliable. However, it can result in a turbid effluent when insufficient filaments grow. The trickling filter/solids contact (TF/SC) process is particularly susceptible to this because most substrate is removed in the trickling filter, leaving little to be removed in the suspended growth bioreactor where filamentous microbial growth occurs. As a consequence, the mixed liquor from a TF/ SC process is fragile and must be handled gently to avoid floe shear and elevated effluent suspended solids concentrations. Growth of insufficient filaments is less of a problem for processes such as roughing filter/activated sludge (RF/AS) and bio-filter/activated sludge (BF/AS) because only a portion of the organic matter is removed in the trickling filter, leaving some to be metabolized in the suspended growth bioreactor. Consequently, a moderate population of filamentous microorganisms can be maintained in such processes, strengthening the floe. A well designed coupled TF/AS process will provide the flexibility for operation in several modes. This is desirable because wastewater treatment facilities are not typically loaded to their design values on a consistent basis. During periods of low loading, the TOL on the trickling filter will be less than the design value, giving a higher degree of treatment there. Since less substrate removal will be required in the suspended growth bioreactor, the flexibility should be provided to reduce its SRT to lower aeration power requirements. This may also be necessary to avoid unwanted nitrification. Plant operations personnel must effectively use the operational flexibility provided in the design to optimize plant performance and minimize treatment costs. For example, during periods of reduced loading, many BF/AS facilities are operated either with less suspended growth bioreactor volume in service or in the ABF mode. Likewise, facilities designed as RF/AS processes can be operated as TF/ SC processes during periods of reduced loading. Finally, a TF/SC system can be operated simply as a trickling filter during periods of reduced loading. Periodic sloughing of biomass occurs in many trickling filter installations. In coupled TF/AS systems this periodic sloughing can lead to a sudden increase in the mass of MLSS in the suspended growth bioreactor.1" 22 42 Because of the good sludge settling properties of the suspended biomass, such sudden increases can often be tolerated with little or no adverse impact on effluent quality. However, if the process is loaded to its maximum treatment capacity, such sloughing events can lead to significant loss of suspended solids from the final clarifier, with the associated deterioration in effluent quality. This can be avoided by maintaining sufficient hydraulic loading on the trickling filter to periodically slough excess biomass, demonstrating the importance of this practice. In systems where controlled sloughing is not prac ticed, the mass of MLSS in the suspended growth bioreactor must be maintained at reduced levels in anticipation of periodic sloughing events. An extremely diverse biota can develop in a trickling filter. It contains a variety of organisms, ranging from bacteria to protozoa, worms, adult and larval filter flies (often of the genus Psychoda), and snails. This diverse biota contributes to stabilization of the organic matter applied to the trickling filter by increasing the length of the food chain. For example, protozoa feed on bacteria, worms feed on protozoa, etc., with a yield associated with each trophic level, thereby reducing net biomass production. This is particularly important in rock media trickling filters where an extremely diverse biota can develop. However, in some instances some of these organisms can cause operational problems. Filter flies can be a nuisance, particularly if a large hatch results in sufficient numbers to impact plant personnel and neighbors. Snails cause problems because their shells act like grit, accumulating in downstream unit operations, such as the suspended growth bioreactor of a coupled TF/AS process. They can also accumulate in the solids handling system, such as in anaerobic digesters, resulting in significant volume losses. Filter fly larvae, worms, and snails can cause performance problems in nitrifying trickling filters if they consume biomass faster than it is being produced, as has been observed in a number of pilot-scale and full-scale trickling filters. For these reasons, it is important to control nuisance organisms. In spite of the need, few techniques have been developed to control nuisance organisms in trickling filters. In some cases, chlorination (for all media), flooding (especially rock media trickling filters), and hydraulic flushing have been successful. Media selection also affects the growth of nuisance organisms to some extent. Media with poor wetting characteristics are prone to the growth of nuisance organisms because thev utilize the wet and dry areas of the media for different portions of their life cycle.'"